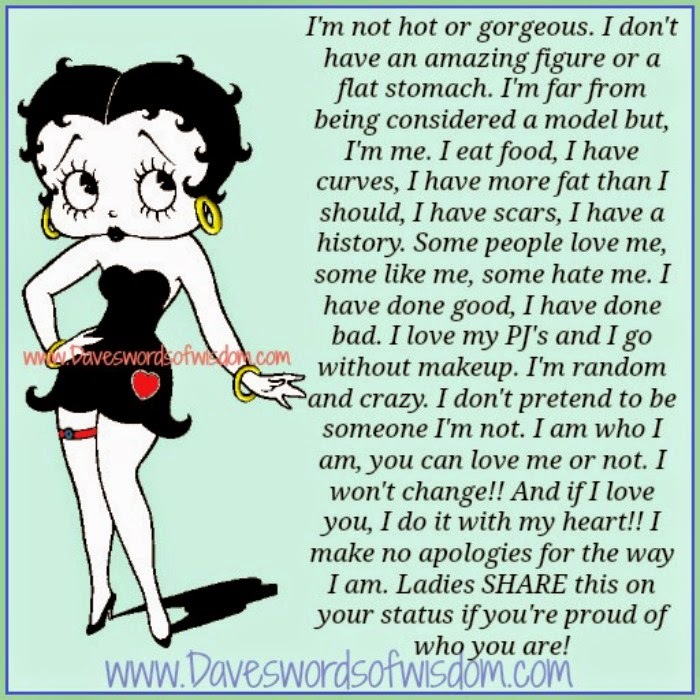 Daveswordsofwisdom.com: I make no apologies for the way I am. I don't have an amazing figure or a flat stomach. I'm far from being considered a model but, I'm me. i eat food, I have curves, I have more fat than I should, I have scars, I have a history, some people love me, some like me, some hate me, I have done good, I have done bad. I love my PJ's and go without makeup. I'm random and crazy. I don't pretend to be someone I'm not. I am who I am, you can love me or not. I won't change, and if i love you, I do it with my heart. I make no apologies for the way I am.